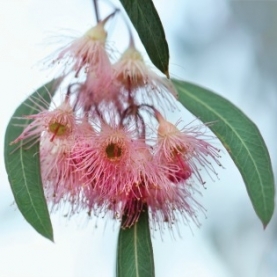 Eucalyptus radiata – Eucalyptus essential oil is a powerful antiseptic. Its antiviral, antimicrobial, antibacterial, mucolytic and decongestant & expectorant properties make it ideal for the cold & flu season, sinus congestion, pneumonia. Research indicates that inhalation of Eucalyptus can improve respiratory function. The 1,8 cineole content acts as an immunomodulator, which helps to reduce inflammatory reactions. It has a cool, cleansing & refreshing aroma that helps to break up mucuous. Rosemary (Rosemary officinalis ct 1, 8 cineole) – Rosemary essential oil is rich in the component 1,8 cineole, known to be beneficial for respiratory ailments like bronchitis, asthma, whooping cough, flu & sinusitis. Research shows Rosemary to be effective against drug resistant bacteria found in the respiratory tract. It has a tonifying effect on the on the lungs & clears phlegm. Known to have antiviral, anti bacterial, antispasmodic & tonic properties. *Avoid with small children, epileptics, pregnant/nursing woman. Ravintsara (Cinnamomum camphora) – Ravintsara essential oil, with over 58% of the component 1,8 cineole, has analgesic, antifungal, antibacterial & antimicrobial properties. It can help loosen mucous and clear the sinuses. It is an immunostimulant, helping to support the immune system & benefits the entire respiratory system. Long term chronic allergies respond well to Ravintsara. A great oil to diffuse to prevent the spread of germs during cold & flu season. **Inula (Inula graveolens) – Inula essential oil is a powerful mucolytic, beneficial for coughs, bronchitis and asthmatic conditions. Inula specifically targets the upper respiratory tract. A great addition to an inhaler or diffuser blend. Therapeutically it acts as an anti-inflammatory, antibacterial, antispasmodic & decongestant.